The image below covers a period of just over one day. On November 26, 2013, peak readings were as high as 2392 ppb. The green circle highlights an area with high methane levels just north of Greenland. 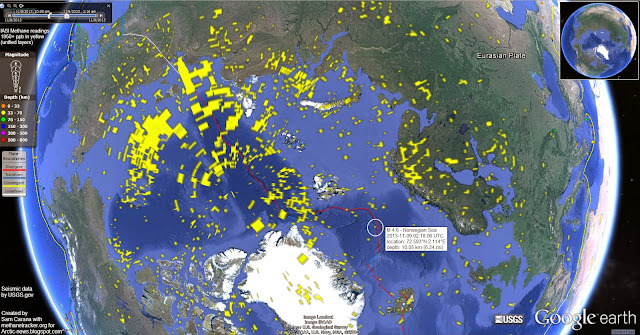 This methane likely originates from hydrates along the fault line that crosses the Arctic Ocean. As the Naval Research Laboratory animation below shows, sea ice in that area is rather thick. How it is possible for the methane to appear there? The answer must be, it seems, that there is so much movement in the sea ice in this area, that there are many cracks through which the methane can rise. Above animation shows how a huge part of the sea ice, meters thick, is pushed along the edges of Greenland into the Atlantic Ocean, as a result of strong winds, as also illustrated by the animation below. 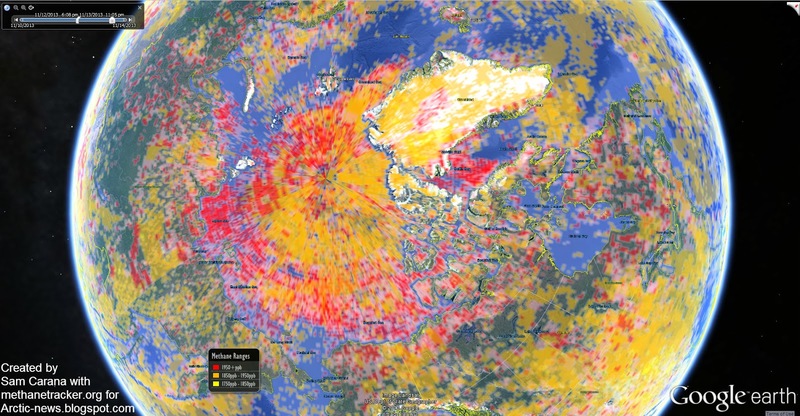 Methane has now been showing up prominently over the entire Arctic Ocean for more than a month and it doesn't look like this situation is coming to an end soon. The animation shows methane over the Arctic Ocean over a period of six days, with each frame covering a period of one day. 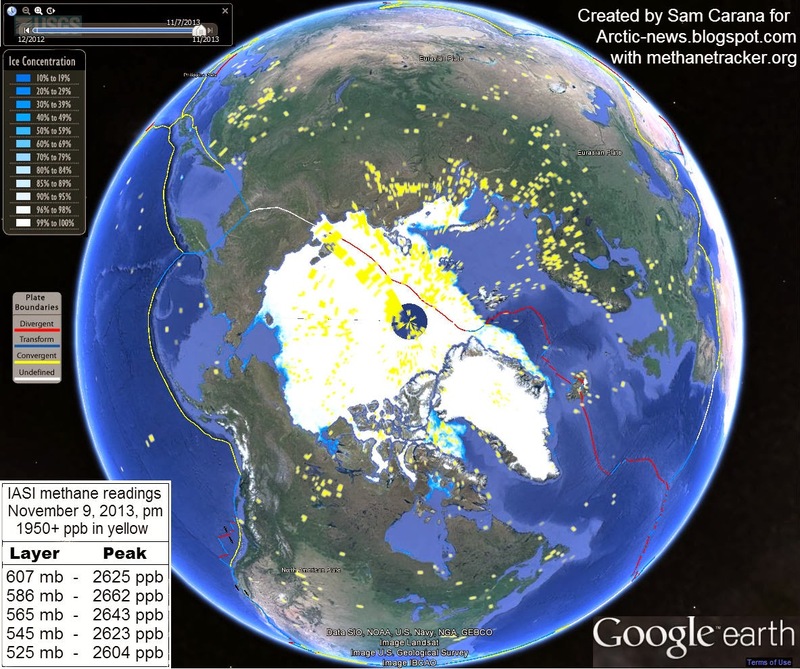 What is the impact of all this methane on temperatures over the Arctic? 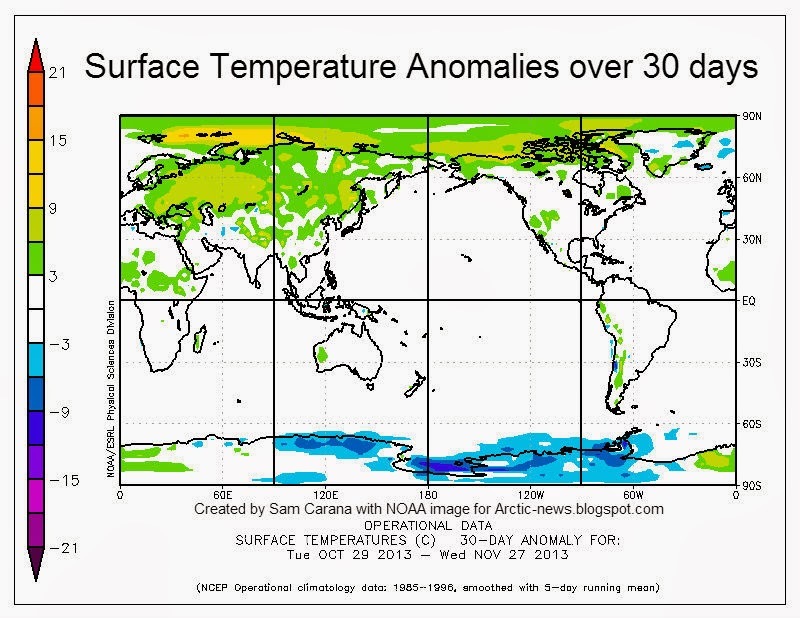 The NOAA image below shows surface temperature anomalies for a 30-day period. When temperatures are averaged over longer periods, peaks will obviously show up less severe. Yet, on above image an area shows up in the Arctic where anomalies have averaged 15 degrees Celsius or more over this 30-day period. When looking at individual days, anomalies of over 20 degrees Celsius can show up, on above image over quite a large area. While the weather can vary a lot and depends on a lot of factors, there is no doubt that the methane cloud hanging over the Arctic Ocean will have contributed to such anomalies. Since this methane isn't just going away soon, this spells bad news for what is ahead in the Arctic. 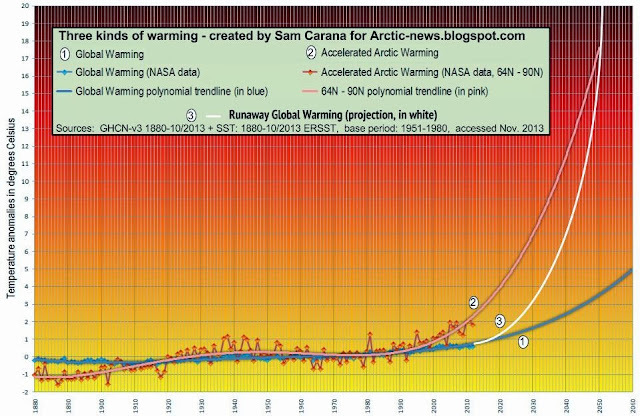 And while most efforts to contain global warming focus on ways to keep global temperature from rising with more than 2°C, a polynomial trendline already points at global temperature anomalies of 5°C by 2060. 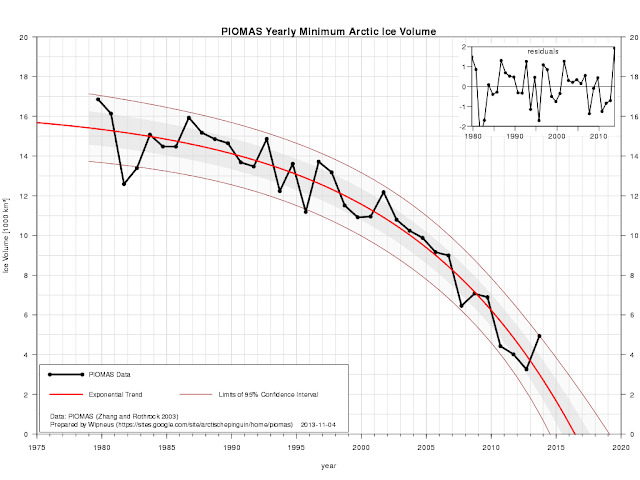 Even worse, a polynomial trend for the Arctic shows temperature anomalies of 4°C by 2020, 7°C by 2030 and 11°C by 2040, threatening to cause major feedbacks to kick in, including albedo changes and methane releases that will trigger runaway global warming that looks set to eventually catch up with accelerated warming in the Arctic and result in global temperature anomalies of 20°C+ by 2050. The paper 'Ebullition and storm-induced methane release from the East Siberian Arctic Shelf', was published in the journal Nature Geoscience on November 24, 2013. The paper is dedicated “to the memory of the crew of Russian vessel RV Alexei Kulakovsky”, the 11 people who died when their tugboat perished in efforts to assist the scientists who were measuring methane from a fishing boat. 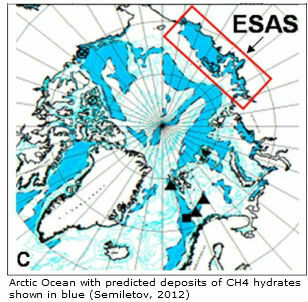 The research team used methods including drilling into the seabed of the Laptev Sea and sonar to analyse methane releases in the water, seeking to quantify the significant amounts of methane that are bubbling up from the sea bed in the East Siberian Arctic Shelf (ESAS, rectangle on image below), the area with shallow seas north of Siberia covering some 810,800 square miles (2.1 million square kilometers). By comparison, the United States (land and water) covers an area of nearly 10 million square kilometers. “We have proven that the current state of subsea permafrost is incomparably closer to the thaw point than terrestrial permafrost, and that modern warming does contribute to warming the subsea permafrost,” says Natalia Shakhova, adding that an increase in storminess in the Arctic would further speed up the release of methane. The scientists estimate, on the basis of the sonar data, that “bubbles escaping the partially thawed permafrost inject 100–630 mg methane square meters daily into the overlying water column”, and suggest that “bubbles and storms facilitate the flux of this methane to the overlying ocean and atmosphere, respectively”. Some 17 teragrams (Tg or Mt) of methane escapes annually from the ESAS, said Natalia Shakova, lead study author and a biogeochemist at the University of Alaska, Fairbanks. This is an upgrade from the earlier estimate of 8 Tg of annual outgassing from the ESAS (Shakhova et al. 2010). While including a reference to this earlier paper (Shakhova et al. 2010), the IPCC did give much lower estimates for emissions from all hydrates globally and from permafrost (excl. lakes and wetlands), i.e. 6 and 1 Tg per year, respectively. And by comparison, IPCC estimates for all global methane emissions from manmade and natural sources go from 526 Tg per year to 852 Tg per year, of which 514 to 785 Tg per year is broken down (mostly by hydroxyl). Sadly, as discussed in an earlier post, the IPCC has decided NOT to warn people about the danger that methane from hydrates will lead to abrupt climate change within decades. Yet, when entering the data by Shakhova et al. in a spreadsheet, a linear trendline (green line on image below) shows methane release in the ESAS reaching 20 Tg by 2013 and 26 Tg by 2015. An exponential trendline (red/blue line) shows methane release in the ESAS reaching 22 Tg by 2013 and 36 Tg by 2015. 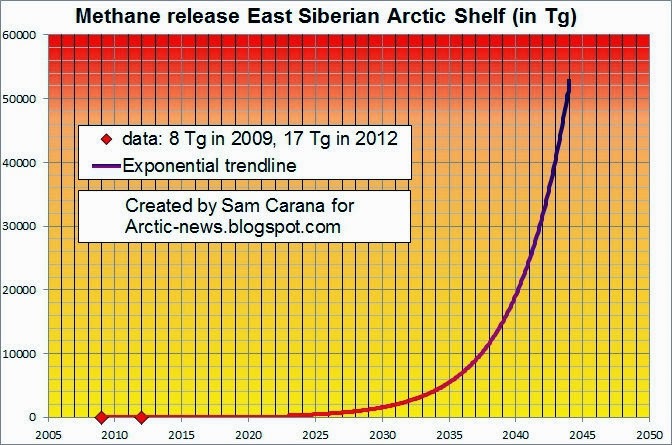 Extending that same exponential trendline further into the future shows methane release in the ESAS reaching 2 Gt by the year 2031 and 50 Gt by the year 2043. Note that accumulated totals over the years will be much higher than the annual release. While the IPCC gives methane a perturbation lifetime of 12.4 years, this methane will persist in the Arctic for much longer because its release is concentrated in the Arctic where hydroxyl levels are also very low. Globally, IPCC/NOAA figures suggest that abundance of methane in the atmosphere currently (2013) is 1814 parts per billion (ppb), rising with 5 or 6 ppb annually, and that this rise is caused by a difference of 8 Tg between the methane emitted (548 Tg, top-down estimate) and broken down annually (540 Tg, top-down estimate). It is also worth noting that the IPCC has increased methane's global warming potential to 86 over 20 years with climate-carbon feedbacks, while there are reasons to assume that methane's impact, especially short-term and in case of large abrupt releases in the Arctic, is even stronger. 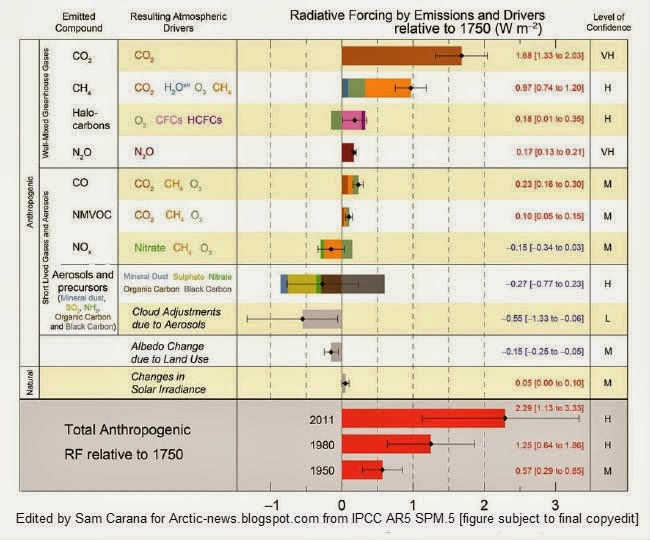 Furthermore, the IPCC now gives methane a Radiative Forcing (RF) of 0.97 W/m-2 (up from 48 W/m-2 in 2007 and relative to 1750), as illustrated by the image below. According to the IPCC, methane levels in 1750 and 2011 were 722 ppb and 1803 ppb, respectively. The total global methane burden is estimated to be about 5 Gt, i.e. 5 petagrams (Pg) or 5,000 Tg. A back-of-envelope calculation sugests that the methane burden in 1750 was 5 Gt x (722 : 1803) = 2 Gt. Furthermore, methane's 0.97 W/m-2 RF is 42% of the total RF 2.29 W/m-2. Therefore, the 3 Gt of methane that has been added to the atmosphere since 1750 is responsible for almost half of all the global warming since that time. For now, the IPCC's estimated annual increase in global methane levels may seem small, but this figure appears to be based on low-altitude data collected over the past few decades. The total methane burden may already be rising much more rapidly, also because methane is rising in the atmosphere, increasing the burden especially at higher altitudes, as evidenced by the increasing occurence of noctilucent clouds. In other words, the 8 Tg estimate may reflect older data related to changes in lower-altitude measurements only, but the total methane burden may well be rising much more rapidly due to increases at higher altitudes. Further analysis comparing satellite data at different altitudes over the years could verify this. An earlier post estimated that as much as 2.1 Mt (or 2.1 Tg) of methane could have been released abruptly end 2011. 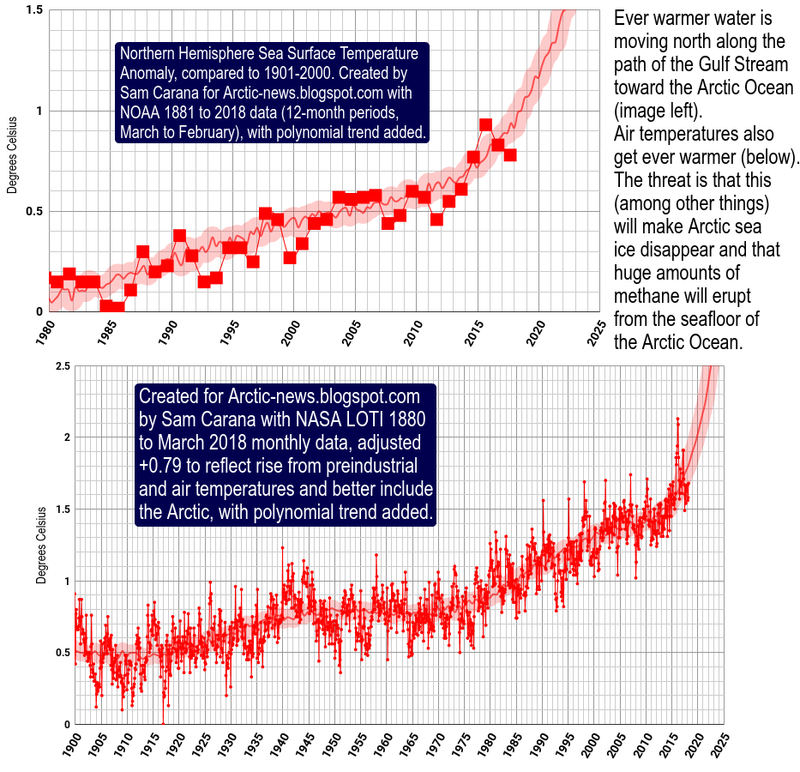 If you compare the animation of that earlier post with the recent animation, then current abrupt releases from the sea floor of the Arctic Ocean appear to be even higher. As said, methane releases from the Arctic Ocean may for now seem small and may not yet make global temperatures rise much, but nonetheless the methane cloud hanging over the Arctic is contributing to warming locally. Combined with the increased likelyhood of extreme weather and rapid loss of ice and snow cover in the Arctic, this could make water temperatures in the Arctic Ocean rise even further, causing further destabilization of methane hydrates. Furthermore, the mechanical force of methane release from hydrates (rapidly expanding 160 times in volume) itself can also contribute to hydrate destabilization. Seismic activity could also lead to destabilization. 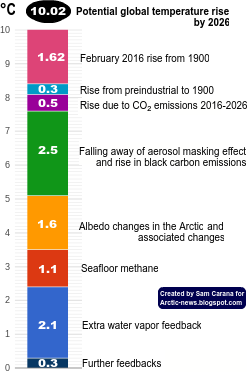 Indeed, there are many factors that could contribute to exponential rise of methane release from the Arctic Ocean, as discussed in the post on methane hydrates, which calls for comprehensive and effective action, such as discussed at the Climate Plan blog. 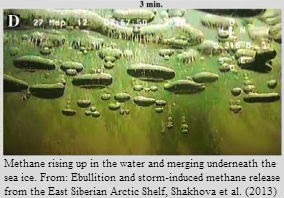 Extensive methane venting to the atmosphere from sediments of the East Siberian Arctic shelf, by Natalia Shakhova, Igor Semiletov, Anatoly Salyuk, Vladimir Yusupov, Denis Kosmach, and Örjan Gustafsson, in: Science, 327, 1246-1250 (2010). 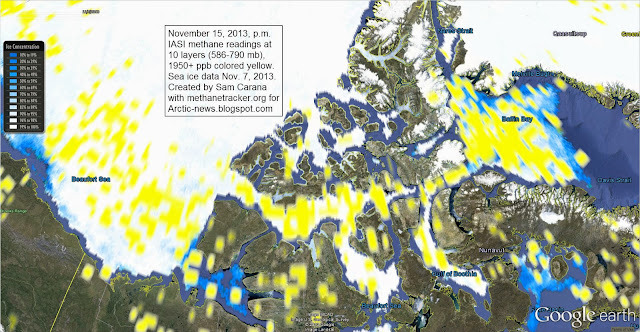 High levels of methane were recorded all over the Arctic Ocean on November 19, 2013, as illustrated by the image below. The image also shows that most methane was present over the fault line that crosses the Arctic Ocean (as also indicated on the inset). A recent post described that more methane may actually be present closer to the North Pole than IASA images may indicate. This because measurements can be obscured by clouds. 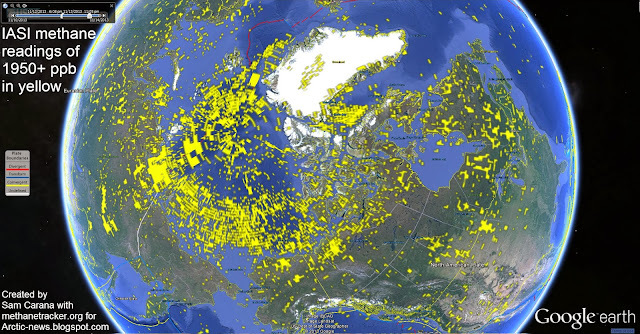 If no data are recorded over a certain area, no methane levels will show up on images for the respective area. This was the case on November 17, 2013, when the Arctic Ocean was quite cloudy, and little or no data were recorded for the center of the Arctic Ocean. On November 19, 2013, the sky was much clearer, resulting in a lot of data from the center of the Arctic Ocean, as also illustrated by the image below. In conclusion, high methane levels can actually be present all over the Arctic Ocean, even when images only show high levels in some areas. An earlier post described how the sea ice can act as a shield, especially when the ice is more than one meter thick. How does this rhyme with the above image? The November 19, 2013, Naval Research Laboratory image on the right shows that the sea ice was meters thick in some locations where methane shows up on the top image. So, is methane actually rising from the seafloor of the entire Arctic Ocean, perforating even the thickest ice and entering the atmosphere all across the Arctic Ocean? Or, if thick sea ice does act as a shield, how did methane appear all over the Artic Ocean in such huge quantities? The images on the right indicate that the methane may actually only rise from the seafloor in a few locations. 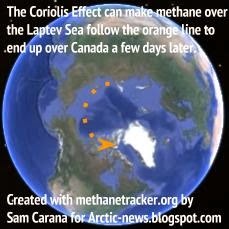 As the top image on the right says, the Coriolis Effect can make methane over the Laptev Sea end up over Canada a few days later. So, methane may not be perforating the sea ice in the north of Canada, but may instead originate from elsewhere in the Arctic. The animation underneath shows methane readings from November 9 to 19, 2013, with each of the 20 frames covering a period of 24 hours and with frames following each other up 12 hours after each other. 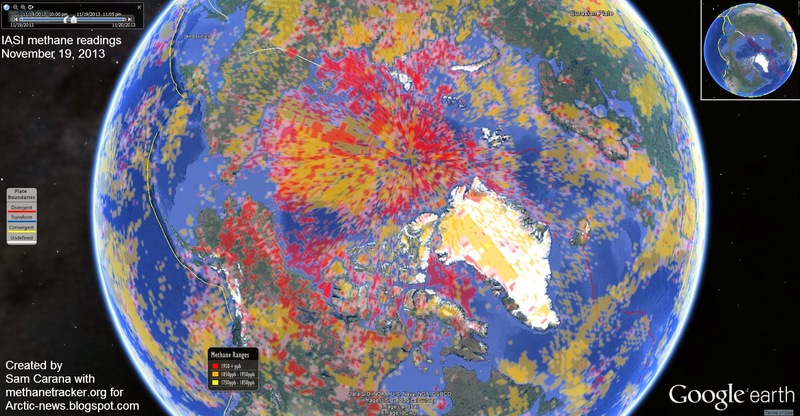 As the animation shows, it looks like methane is predominantly entering the atmosphere at specific locations, most notably along the fault line that crosses the Arctic Ocean. It may well be that this methane ends up all the way in Baffin Bay, to the left of Greenland. Since the Greenland ice sheet is 3 kilometers (1.9 miles) thick, this may form a natural barrier that keeps the methane there, also helped by winds rising vertically from Baffin Bay to well above Greenland's mountains. Methane may also be traveling under the sea ice, all the way from the Gakkel Ridge and the Laptev Sea right to Baffin Bay. On the other hand, it could also be that hydrates underneath the sea bed of Baffin Bay itself have become destabilized and that, since the ice over Baffin Bay is rather thin, methane has no problem perforating the ice and is entering the atmosphere there in huge quantities. Either way, the end-conclusion is that the methane that is now showing up all over the Arctic Ocean, is rising from the seafloor, due to destabilization of sediments that hold huge amounts of methane in the form of free gas and hydrates. As warming in the Arctic continues to accelerate, the danger is that this will cause more methane to rise from the seafloor and that the methane itself will contribute to warming in the Arctic, in a deadly spiral set to cause abrupt climate change at a devastating scale. 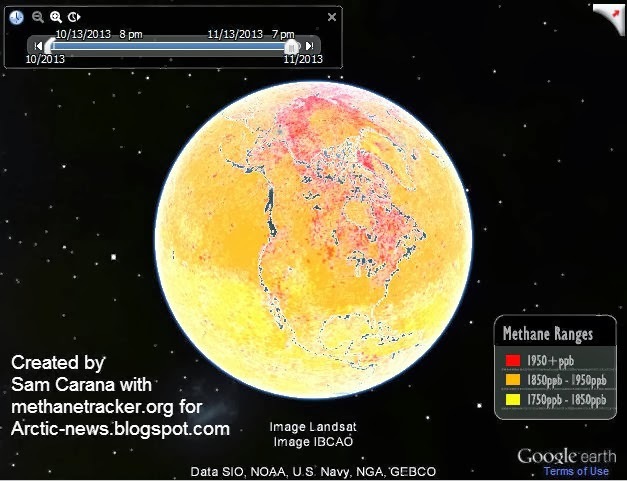 The image below shows methane readings on November 17, 2013 p.m. 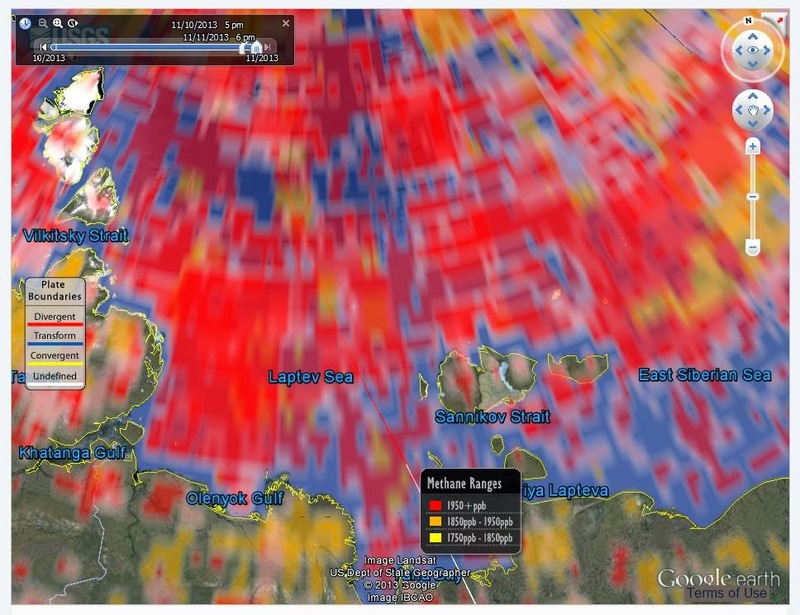 Very high methane readings are present over the Laptev Sea, the East Siberian Sea and the Beaufort Sea. The situation may be even worse than what it seems at first glance. 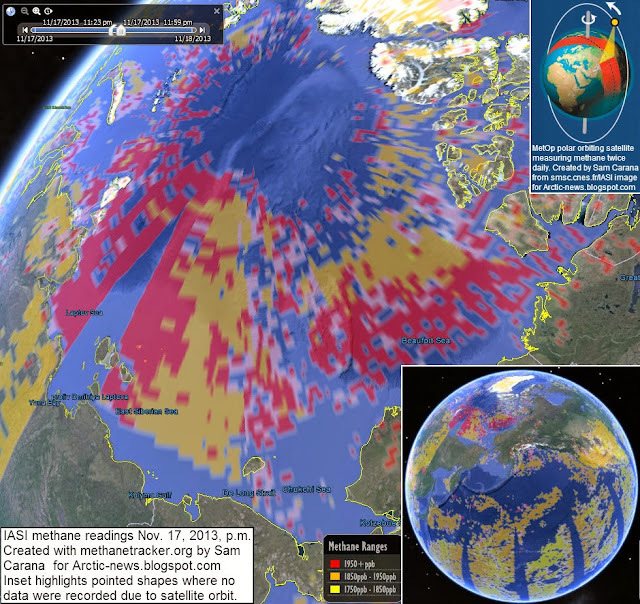 The pointed shape in the Laptev Sea doesn't imply low methane levels in that area. The IASI (Infrared Atmospheric Sounding Interferometer) instrument measuring methane only covers a certain width. The pointed shapes that show up on above image and the bottom inset, are areas where no measurements were taken, resulting from the way the polar-orbiting satellite circum-navigates the globe, as pictured on the top inset. These pointed shapes are visible as light-grey areas on the image below. Additionally, no data were available for the areas colored darker grey on above image. At lower altitudes, this absence of data can be due to mountains in the area. It can also be that measurements are obscured by clouds, in which case no data are visible for the respective area; again, this doesn't imply that no methane was present there. So, while there are no data for some areas in the Laptev Sea on Nov. 17, the conclusion must noretheless be that methane was actually present at very high levels all the way from the Laptev Sea to the East Siberian Sea. This conclusion is supported by data from earlier days, e.g. as shown in this post. Therefore, the situation in the Laptev Sea is worse that it looks at first glance and levels may actually have been even higher on Nov. 17 than the peak reading of 2304 ppb that was recorded on that day. Similarly, more methane may actually be present closer to the North Pole than is showing up on above images. For some time now, huge amounts of methane have been released from the seabed of the Arctic Ocean, reaching the atmosphere at levels of up to 2662 ppb (on November 9, 2013). What caused this? Before examining this further, let's first go back to what was said in an earlier post about warm water off the coast of North Anmerica. During the 1930s, North America experienced a devastating drought affecting almost two-thirds of the United States as well as parts of Mexico and Canada. 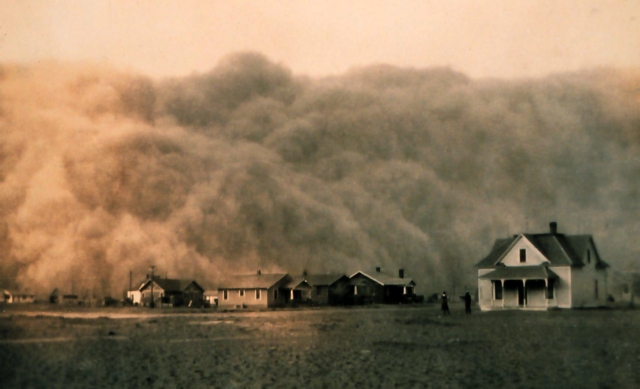 The period is referred to as the Dust Bowl, for its numerous dust storms. Rapid creation of farms and use of gasoline tractors had caused erosion at massive scale. Extensive deep plowing of the virgin topsoil of the Great Plains in the preceding decade had removed the natural deep-rooted vegetation that previously kept the soil in place and trapped moisture even during periods of drought and high winds. So, when the drought came, the dust storms emerged. But what caused the drought? A 2004 study concludes that the drought was caused by anomalous tropical sea surface temperatures (SST) during that decade and that interactions between the atmosphere and the land surface increased its severity (see image above right with SST anomalies). 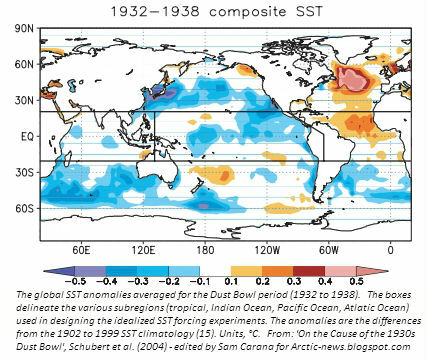 As the above chart shows, SST anomalies in the days of the Dust Bowl were not greater than 1°C. It is in this context that the current situation in the Arctic must be seen. In 2013, SST anomalies of 5°C or more showed up in virtually all areas in the Arctic Ocean where the sea ice disappeared; some areas are exposed to sea surface temperature anomalies even higher than 8°C (14.4°F), as discussed in the post Arctic Ocean is turning red. As the above Naval Research Laboratory image shows, strong winds can push a lot of sea ice out of the Arctic Ocean. The resulting absence of sea ice can disrupt vertical sea currents that would otherwise cool the seabed. Furthermore, strong winds can boost warming of the seabed of the Arctic Ocean by mixing warm surface water down the vertical water column. Such feedbacks have been discussed in earlier posts such as the Diagram of Doom. Changes that take place in the Arctic can also cause extreme weather patterns elsewhere, as discussed in an earlier post on changes to the Polar Jet Stream. Indeed, events can be closely interlinked and the world is now stumbling from one extreme weather event into another. Moreover, things look set to get worse every year. And this can in turn make things even worse in the Arctic. Water off the coast of North America, after reaching 'Record Warmest' temperatures in July 2013, proceeded to travel to the Arctic Ocean, where it is now warming up the seabed. Pollution clouds pouring eastwards off the coast of Canada and the United States are the main culprits in heating the Gulf Stream as this region has the highest oceanic evaporation on Earth. 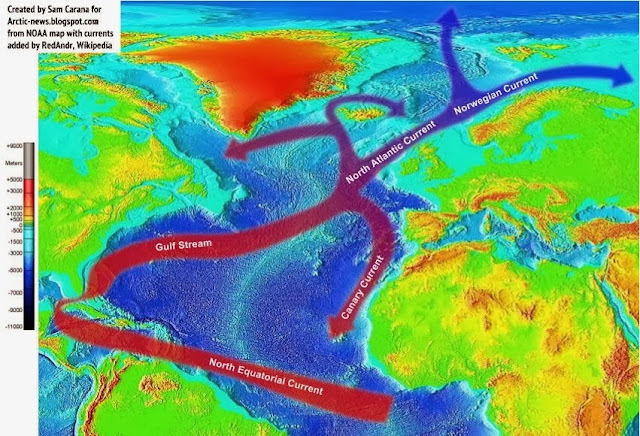 While the mean speed of the Gulf Stream is 4 miles per hour (6.4 km/hour or 1.78 metres/second), the water slows down as it travels north. In the much wider North Atlantic Current, which is its North Eastern extension, water flows at about 0.51 metres/second (3.5 times slower), while the West Spitzbergen (Svalbard) current flows at about 0.35 metres/second (5 times slower). Consequently, it will take quite some time for the summer-heated Gulf Stream waters to reach the Laptev Sea. In addition, because the Gulf Stream does a closed circuit in the tropical Atlantic, passing close to West Africa (Canary Current) and returning back to the Gulf along the hurricane tracks (North Equitorial Current), it is able to continuously feed hot water into the North Atlantic Current over a very long time period. This explains why methane is continuously boiling off the subsea methane hydrates from the Eurasian Basin and Laptev Sea during September to November this year and will continue to be emitted past January 2014. The atmospheric temperature increase in Australia this year (0.22oC) indicates that in 10 years it will exceed 2.2oC and in 30 to 40 years, 6.6oC to 8.8oC. This is the same as the predicted temperature increase from the Arctic methane build up and will lead to total global deglaciation and our extinction by the middle of this century. There is in addition a delayed carbon dioxide and methane temperature anomaly of 12oC to 20oC. The 20oC methane delayed temperature anomaly is the same as the temperature anomaly of the hot clouds that have been blowing around the Arctic this year, indicating that the Arctic has almost caught up with the methane delayed global warming heating. The stage is therefore set for a giant firestorm, drought and sea level rise mostly caused by the uncontrolled build up of methane in the atmosphere due to the carbon dioxide induced global warming destabilization of the Arctic permafrost and subsea methane hydrates. The power, prestige and massive economy of the United States have been built on cheap and abundant fossil fuels and Canada is now trying to do the same. Will the US and Canada, in the short time frame we have left (3 decades), be able to eliminate their extreme carbon footprints? Note that Australia, Saudi Arabia and the United Arab Emirates have similar extreme carbon footprints as well. An additional problem is that reducing emissions from coal-fired power plants will also reduce sulfur emissions that currently mask the full wrath of global warming. What we have got to do is eliminate as much of the atmospheric methane by whatever means we are able to devise, to bring its concentration down to about 750 ppb. This level will eliminate the methane delayed temperature anomaly and give the massive industrial nations a little leaway to get their houses in order. All the scientific expenditure and ingenuity of the major industrial nations should be engaged in developing methods of breaking down atmospheric methane without burning it. Methods of increasing the tropospheric and stratospheric hydroxyl concentrations and using radio - laser systems such as the Alamo - Lucy projects and their applications to HAARP must be developed and tested with the utmost urgency as should local methods of converting carbon dioxide and methane via catalysts into other products. We have to get rid of this methane monster before it devours us all. A French group of scientists and engineers have started work on the Alamo-Lucy projects in Europe. If we fail to reduce the fast growing methane content of the atmosphere in the next few decades we are going to go the same way as the dinosaurs. I cannot emphasise more, how serious humanity’s predicament is and what we could do to try to prevent our certain extinction if we continue down the present path we are following. If we compare ourselves to the Titanic we are only moments away from hitting the iceberg. Three more images are added to further illustrate Malcolm Light's words. 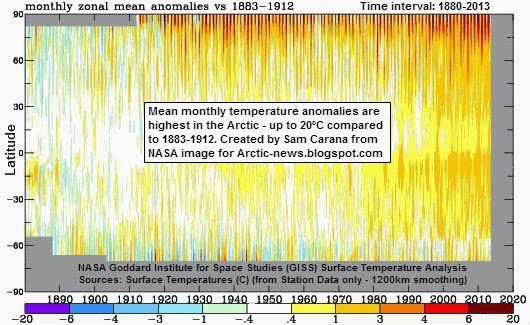 The above image highlights how much temperatures have been rising in the Arctic over the past few decades. In above image, anomalies are visualized by latitude, but are averaged by longitude globally, masking even higher anomalies that can be experienced at specific areas along the same longitude. At times, some areas in the Arctic do already experience anomalies of over 20°C, as also shown by the image below. Finally, the image below, from a post at the methane-hydrates blog. All this calls for comprehensive and effective action, as described at the Climate Plan blog. The image below shows methane readings of 1950 ppb and higher, as at November 15, 2013, p.m., close to sea level. 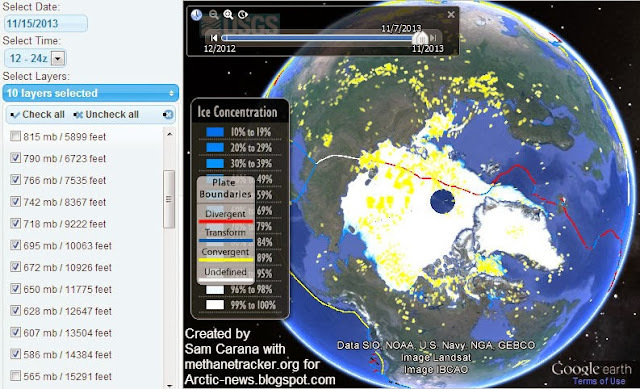 The image also shows sea ice concentration, as at November 7, 2013, i.e. the most recent SSMIS data available on methanetracker. 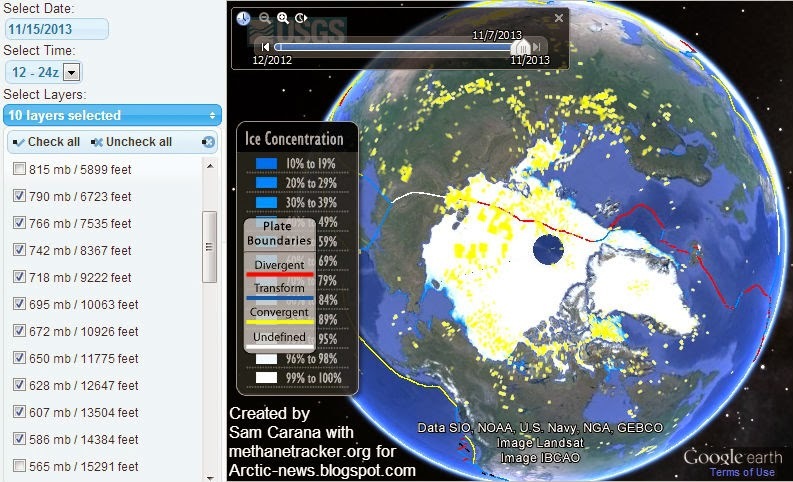 The image shows huge amounts of methane rising from the seafloor along the fault line that crosses the Arctic Ocean. The image also shows huge amounts of methane over thinner parts of the sea ice. To illustrate this further, the November 15, 2013, Naval Research Laboratory image is added below, showing ice thickness based on the most recent sea ice data. The image below zooms in on the large amounts of methane, stretching out all the way from the Beaufort Sea to Baffin Bay. Above image illustrates that methane does show up prominently where the sea ice is thin, confirming earlier conclusions that the sea ice acts as a shield, a seal if you like, holding the methane in place and thus giving microbes the time needed to decompose the methane while it is held underneath the ice. This spells bad news, because it implies that, as the sea ice thins, more methane will be able to enter the atmosphere and contribute to warming that is already accelerating in the Arctic. As discussed in a recent post, methane is rising from the seafloor of the Arctic Ocean due to destabilization of sediments that hold huge amounts of methane in the form of free gas and hydrates. This destabilization is in part due to warm water flowing in the Arctic Ocean along the Gulf Stream. 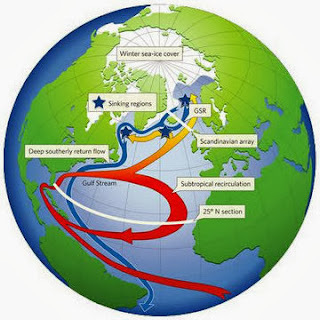 Record warm water was present off the coast of North America in July 2013, and this warm water took some time to reach the Arctic Ocean, as shown on the image below, from that earlier post. Water in the currents that are returning water to the Atlantic Ocean north of Canada is typically cold, as indicated by the blue color on the image below. So, while it is possible that the water was still sufficiently warm to cause methane releases from the seabed in the Beafort Sea and in Baffin Bay, in the northern parts of Canada, it seems more likely that the methane originated from areas along the fault line that crosses the Arctic Ocean and that the methane traveled - underneath the sea ice - with these currents all the way to the edges of the sea ice where the ice is sufficiently fractured and thin to allow methane to rise to the surface. 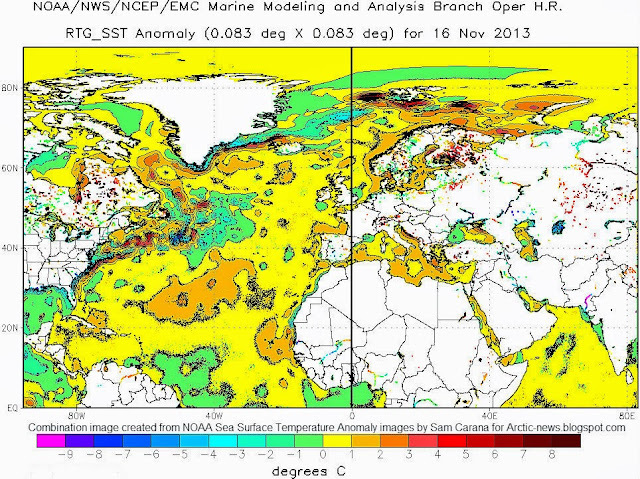 This seems confirmed by recent sea surface temperature data, as pictured below. As above image shows, sea surface temperature anomalies (in orange, red and brown) are still showing up prominently along many parts of the Gulf Stream, all the way into the Arctic Ocean, where anomalies of more than 8 degrees Celcius have been recorded for some time now. At the same time, colder water (in green and blue) is flowing back into the Atlantic Ocean from the Arctic Ocean, along the edges of Greenland and further south. Colder currents typically flow at greater depth, but the above image also shows colder waters emerging at sea surface level, especially in areas somewhat off the coasts of Newfoundland and Nova Scotia, effectively preventing some warm water from traveling along the Gulf Stream to the Arctic Ocean. Why are the currents that are flowing out of the Arctic Ocean into the Atlantic Ocean so strong at the moment? Powerful winds have speeded up these currents, as illustrated by the 30-days Naval Research Laboratory animation below, which also includes a 7-days forecast from November 15, 2013. One of the feedbacks of accelerated warming in the Arctic is stronger winds and a huge amount of sea ice is currently flowing into the Atlantic Ocean, partly due to these strong winds. Similarly, the Naval Research Laboratory animation below shows huge amounts of sea ice, often very thick ice, being pushed into the Atlantic Ocean. Last but not least, the youtube video below, Arctic Death Spiral and the Methane Time Bomb, shows some of the most powerful video footage on climate change, highlighting the danger that methane will continue to rise from the seafloor of the Arctic Ocean in ever greater quantities, resulting in a wipe-out of civilization, extinctions at massive scale and devastation of the planet as we know it. "I am fighting for the lives of my children, grandchildren, and great grandchildren who's lifespan will extend 30 to 40 years from now. I am also fighting for all children of the world, animals, whales, dolphins, flowers and all living things. They are all in peril and we are the ones that may have a chance of doing something about it now. The threat of what is coming must sink in." The image below shows methane readings over a one-month period. As the image illustrates, high methane emissions, i.e. at 1850 ppb and higher, are more prevalent on the northern hemisphere, while emissions on the southern hemisphere are mostly under 1850 ppb. The contours of North America are visible, with Greenland to the north. Further north, over the Arctic Ocean, the color red dominates, indicating emissions of 1950 ppb and higher. In which part of the Arctic Ocean are most emissions recorded? The image below shows recent methane readings of 1950 and higher, this time colored in yellow, for a period of just over one day during November 12 and 13, 2013. The largest area colored solid yellow is over the Laptev Sea, just north of Siberia. Below is an image of the same period as above image, but once more showing methane levels in ranges, i.e. readings of 1950 ppb and higher in red, as well as lower readings in orange and yellow. Over the Arctic Ocean, high methane readings dominate the picture, both readings of 1950 ppb and higher, and readings in the range of 1850 ppb to 1950 ppb. 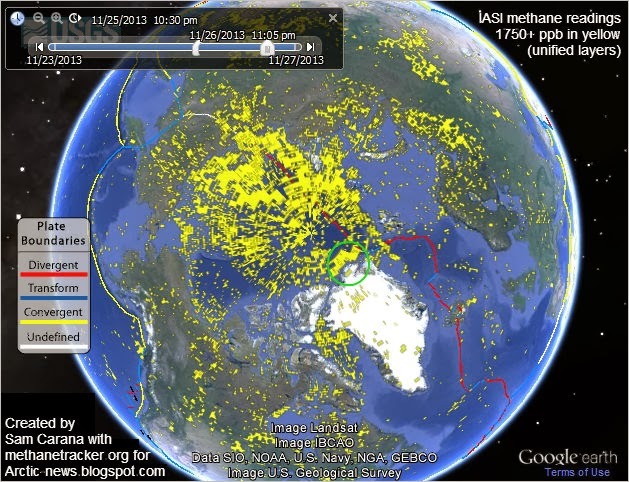 What makes high methane releases over the Laptev Sea so scary? about 700 Gt in free gas beneath the gas hydrate stability zone. Shakhova et al. in 2008 considered release of up to 50 Gt of predicted amount of hydrate storage as highly possible for abrupt release at any time. By comparison, the total amount of methane currently in the atmosphere is about 5 Gt. On November 9, 2013, methane readings well over 2600 ppb were recorded at multiple altitudes, as illustrated by the image below. On November 9, 2013, p.m., methane readings were recorded as high as 2662 parts per billion (ppb), at 586 millibars (mb) pressure, which corresponds with an altitude of 14384.6 feet or 4384.4 meters. Where did these high levels occur? Methane levels were low on the southern hemisphere and, while there were some areas with high readings over North America and Asia, there were no areas as wide and bright yellow as over the Arctic Ocean (the color yellow indicating readings of 1950 ppb and higher on above map). As discussed in a previous post, huge amounts of methane are now escaping from the seabed of the Arctic Ocean, penetrating the sea ice, and entering the atmosphere, in a process that appears to be accelerating, resulting in huge amounts of methane in the atmosphere over the Arctic Ocean. 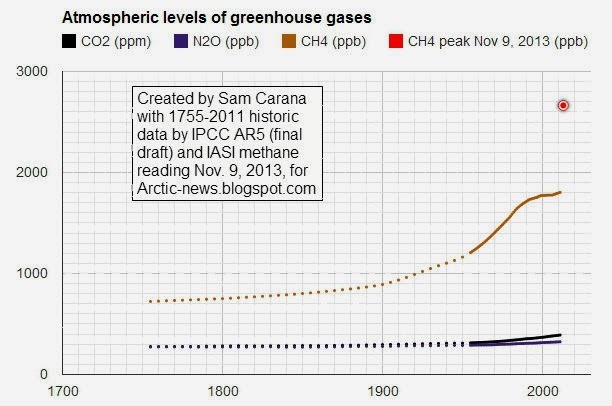 The image below gives an idea of the height of this level, compared to historic levels, and how fast levels of methane (CH4) have been rising compared to levels of two other greenhouse gases, i.e. carbon dioxide (CO2) and nitrous oxide (N2O). Recent peak levels of methane over the Arctic Ocean may well have been even higher, since NOAA didn't release any readings for November 5-7, 2013. Meanhwile, sea ice extent has stopped growing, as illustrated by the NSIDC graph below. Data from the Cryosphere Today show that the area covered by sea ice has actually fallen over the past few days, as illustrated by the image below. 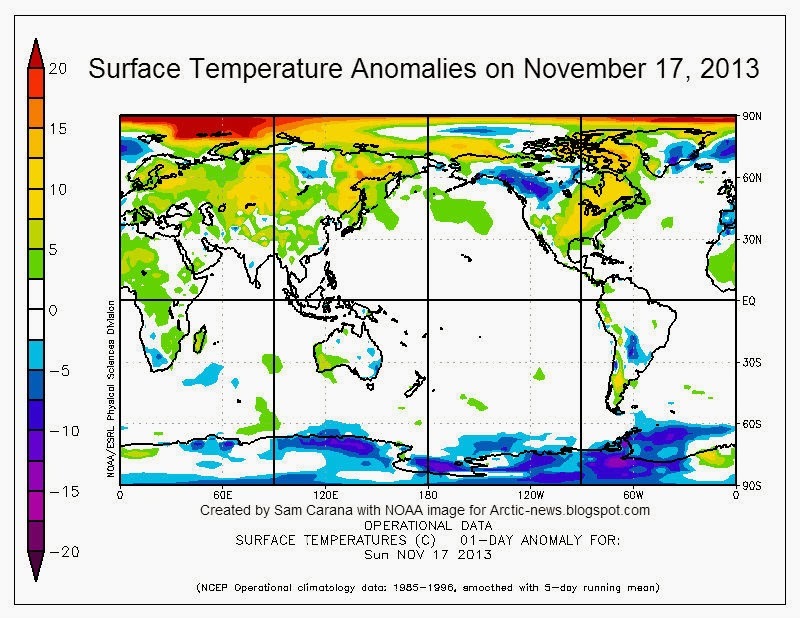 There are several reasons why sea ice isn't growing, including high temperature anomalies in the Arctic, as illustrated by the NOAA image below, showing surface temperature anomalies of over 20 degrees Celsius on November 7, 2013. High methane levels are contributing to temperature anomalies, by trapping additional sunlight in the atmosphere over the Arctic Ocean. Furthermore, strong winds have hit the sea ice, as the recent post Methane, Faults and Sea Ice warned. Strong winds are pushing sea ice inward in the Kara Sea and in the Chukchi Sea, while pushing sea ice - up to 5 meters thick - out of the Arctic Ocean along the coast of Greenland, as illustrated by the Naval Research Laboratory animation below. The Naval Research Laboratory image below shows ice speed and drift on November 9, 2013. So, could Arctic sea ice collapse and totally disappear in September 2014? Posts at this blog have repeatedly warned about this, e.g. in this post. The image below, created by Wipneus, shows an exponential trendline pointing at zero volume sea ice in September 2016. All data over the past two decades have fallen within the 95% confidence limits of an exponential trendline that points at imminent loss of all Arctic sea ice within years. 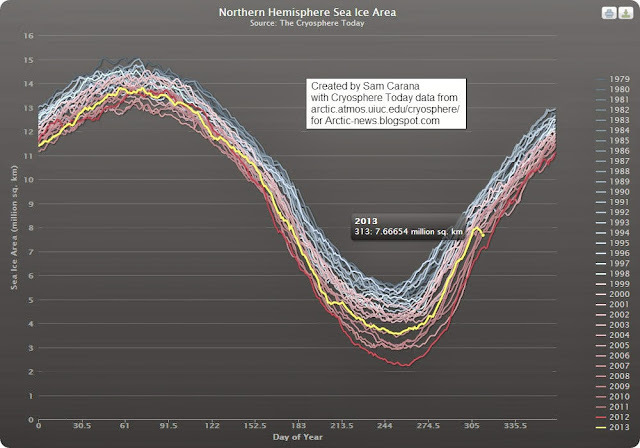 September 2013 may have been "only" the 4th lowest on record, but such variability can be expected and may well cause sea ice to disappear completely as early as September 2014. ". . apart from melting, strong winds can also influence sea ice extent, as happened in 2007 when much ice was driven across the Arctic Ocean by southerly winds (not northerly, as she stated). The fact that this occurred can only lead us to conclude that this could happen again. Natural variability offers no reason to rule out such a collapse, since natural variability works both ways, it could bring about such a collapse either earlier or later than models indicate. Guy McPherson lists 26 feedbacks that speed up warming, and many of these feedbacks occur in the Arctic, as described in the post Diagram of Doom. 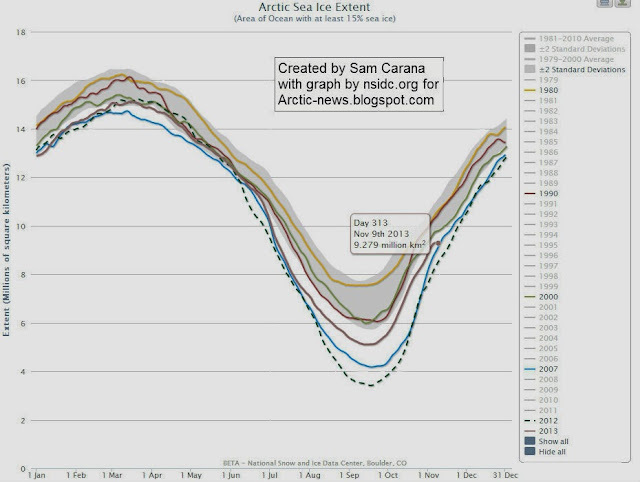 Soon, calculates Prof. Peter Wadhams, the albedo loss due to decline of snow and ice in the Arctic will effectively more than double the net radiative forcing resulting from the emissions caused by all people of the world. Additional warming caused by methane releases from the Arctic seabed could be even more devastating. Hopefully, more people will realize the urgency of the situation and realize the need for a comprehensive and effective plan of action as described here. In the early morning of November 9, 2013, the Norwegian Sea was hit by an earthquake with a magnitude of 4.6 on the Richter Scale. Earlier (on October 28, 2013), an earthquake with a 5.3 magnitude hit the Greenland Sea closer to Svalbard. These earthquakes come at a time when huge amounts of methane are rising from the seabed of the Arctic Ocean, from areas on or close to the fault line that crosses the Arctic Ocean. The location of the earthquake that hit the Norwegian Sea is indicated on the map below with a white circle.